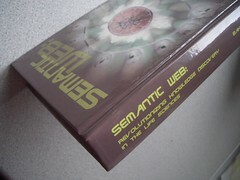 Semantic Web for Life Sciences Book | O'Really? A group of semantic webheads (aka HCLSIG the Health Care and Life Sciences Interest Group) led by Christopher J. Baker and Kei-Hoi Cheung and gathered together on public-semweb-lifesci@w3.org have written a book about the semantic web for life sciences. I haven’t seen the final printed version of this book yet, but if you want to add it to your christmas amazon wishlist, its called Semantic Web: Revolutionizing Knowledge Discovery in the Life Sciences (ISBN:0387484361). The table of contents for the book (DOI:10.1007/978-0-387-48438-9) has more details if you are interested. So what about other readers, what bioinformatics presents (not just books) would they like to find under the Christmas tree this year? If you don’t celebrate Christmas, what Solstice wishes do you have?